Celebrating moms and motherhood began way back in the age of the old Greeks and Romans, who held festivities honouring mother goddesses Rhea and Cybele, however the clearest current point of reference for Mother's Day is the early Christian festival known as "Mothering Sunday." Once a major tradition in the United Kingdom and parts of Europe, this festival fell on the fourth Sunday in Lent and was initially observed as a period when the faithful would come back to their "mother church"— the main church in their home region—for a special service. Generations after generations, the Mothering Sunday tradition shifted into a more traditional holiday event, and kids would give their moms flowers and tokens of their appreciation. This custom lessened and decreased in popularity before merging with the American Mother's Day in the 1930s and 1940s. While there are many versions of Mothers Day celebrations around the world, traditions vary depending on the country. In Thailand, for instance, Mother's Day is constantly celebrated in August on the birthday of the present ruler, Sirikit. Another substitute recognition of Mother's Day can be found in Ethiopia, where families accumulate each tumble to sing melodies and eat a huge devour as a major aspect of Antrosht, a multi-day festivity regarding parenthood. In the this country, the word, "mother" is denoted as "Ilaw ng Tahanan" (the light that brightens a home). The word also is associated with something that describes the comfort and warmth that they bring to the home, and their nurturing power to heal and to strengthen the family unit. We celebrate mothers' day in abundance and in many forms. Gifts, holidays, money envelopes, fun experiences, a trip to a spa, a new car, flowers, a trip to her favourite restaurant or to see her favourite film at her favourite cinema, and most importantly a meaningful and warm, tight hug to express our thanks to her for being OUR mother. Of course, this tradition has also extended to any female member of the fmily, such as our lolas and our sisters, aunties who have produced their own family units as well. We spend hours on the phone to say how much we love her. Studies have gathered that more phone calls are made on Mother’s Day than any other day of the year! This is Cat. She drives a Ford EcoSport. <>Be like Cat. Ask us how. Has the space that she needs for grocery shopping and for taking kids to school, to take the family and the dog to a trip inside and outside the city. The 5-seater EcoSport gives the perfectly-sized, affordable SUV that women look for. It has a clever design that makes the most of every bit of space. It has 20 accessible compartments including cup holders, side-door pockets, a slide-out drawer under the front passenger seat, and a glove box that can keep food and drinks cool. Imagine all the room it has for every woman’s daily essentials, umbrella, sunglasses, extra clothes, laptop, name it—the EcoSport has the space for it! Takes smart cars to another level. With Ford EcoSport’s Smart Keyless Entry, doors unlock automatically as ou approach the vehicle. Once inside,you only need to push the button to start the engine. It is fully equipped with SYNC™, a technology that allows voice to activate certain features which is suitable for women who are always on-the-go. It lets the driver take phone calls, listen to text messages, and play music, audiobooks or podcasts from any media device. With SYNC™, ladies can catch up with business and family members, work, delegate her projects, while keeping their hands on the wheel and eyes on the road. Comfortable and relaxed driving. From smooth highways to rocky roads, the Ford EcoSport guarantees a comfortable and light driving experience for her. Coupled with good approach and departure angles, its 200mm ground clearance between the driver and the road, potholes, it is built to endure the challenges of the rough terrain. Advanced safety features. Whether it is for city driving, a beach trip or a quick Tagaytay getaway, the EcoSport can cater to any type of adventure she plans to conquer with its array of sleek features. EcoSport’s Electronic Stability Program (ESP) and traction control are features to deal with sharp turn The Anti-lock Braking System (ABS) and Electronic Brake Force Distribution (EBD) are installed in the vehicle to avoid skidding. Packed with power, yet saving on fuel. The EcoSport is equipped with a 1.5L Ti-VCT 110PS/142 Nm engine and a 6-speed PowerShift automatic transmission (5-speed for manual)It saves fuel without conforming with top-of the-line accelerations. In other words, with more smooth driving and less gas-pumping, the EcoSport’s innovative engineering offers drivers more kilometres to a drop of fuel without compromise on power. This allows women drivers to enjoy driving by spending less time at the pump and more time on the road and most importantly, spending on fuel costs. The EcoSport is an Eye Candy. 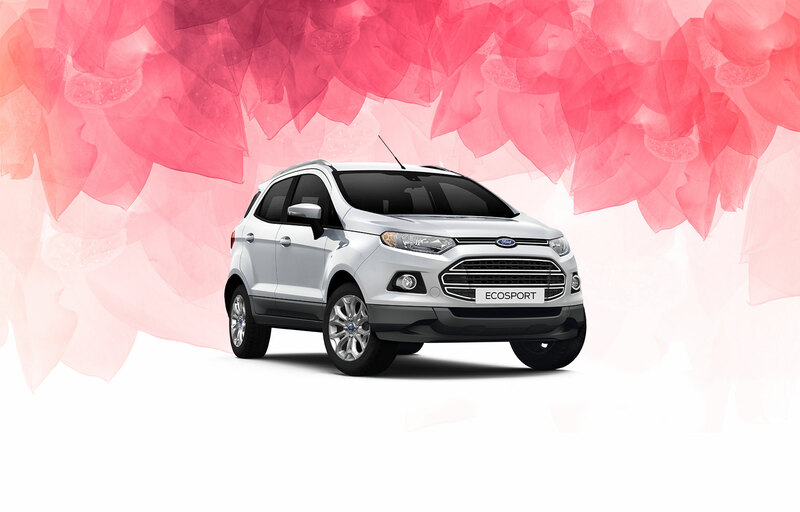 There is always an EcoSport to fit one’s personality and preference for a styish look. EcoSport is available in Panther Black, Ingot Silver, Winning Blue, Candy Red, Mars Red, Frozen White and comes in variants such as Ambiente 1.5L MT, Trend 1.5L MT, Trend 1.5L AT, Titanium 1.5L AT. For a sportier look, The Ford EcoSport Black Edition is also available in the market. Donned in black-finished exterior details such as the grille and alloy wheels. It also has roof cross bars, rear spoiler, illuminated scruff plates, and sport pedals. What a look! Parking is easy-peasy!The EcoSport has built-in rear parking sensors that detect objects in the way when reversing, instantly giving a beeping alert. Where is EcoSport manufactured? - the SUV is also manufactured at Ford India's Chennai plant, for domestic sale and export to the European market. Ford's Rayong plant in Thailand manufactures the EcoSport for Southeast Asian markets. How many seats does an EcoSport have? - The compact SUV will be a 5-seater with a considerable boot space. How can I arrange to test drive an EcoSport? - Simple! Just call us or leave us a message and one of our representatives will be in touch. When is the launch of the New Ford EcoSport? - Expect the 2018 Ford EcoSport to make its official debut in the Philippines soon. Do you have any more Qs?